LET'S MOVE! 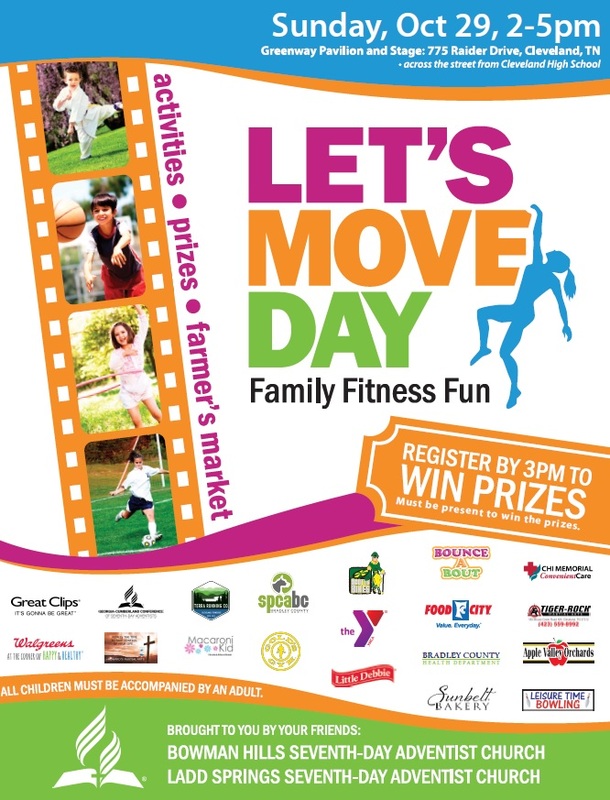 FAMILY FITNESS FUN - Sunday, October 29, from 2-5 PM, in Greenway Park, 775 Raider Drive (across from Cleveland High School), Cleveland, TN. Come and enjoy the bounce obstacle course, pedal-powered smoothie making, gymnastics, martial arts, relays, games and many more activities. Register by 3 pm to win prizes. Get fresh produce at the Farmer's Market. Sponsored by local organizations to help fight childhood obesity and related diseases in Bradley County. Free admission, all welcome. Why a Let’s Move! Day? One in three children in Cleveland/Bradley County is overweight or obese, and at risk for health problems like type 2 diabetes, high blood pressure and heart disease. Let’s help to reverse that by encouraging our kids to be active and to eat more vegetables and fruits! Please share this invitation with your friends in the Cleveland area. Remember to register by 3 pm to qualify for the gift drawings. Hoping to see you next Sunday, October 29!